It likes the dark. It needs the shadows. It is the dark. It is the shadows. It took dad from the family several years ago. Now mum (Maria Bello) is left a hollowed shell, reliant on daily medication and barely capable of caring for her young son. Older daughter Rebecca (Teresa Palmer) has gone a different path, avoiding most interaction and keeping her (unbelievably understanding) occasional ‘boyfriend of convenience’ at arm’s length. With dad gone, mum muttering to herself (?) behind closed doors, and big sis awol, young Martin has every reason to be deathly afraid of the dark, and, as it seems to be targeting him specifically, powerless to evade its shadowy grasp. Cue eighty minutes of power failures, failing flashlights and dodgy lightbulbs. But like your dignity after a drunken night, once the light arrives, ‘it’ vanishes. At least Lights Out proffers more than the ‘random ghost’ thing, though it tries in vain to build a plausible backstory for the menace here. An early sequence sets a tone and despite the need for LOUD NOISES! and an over-reliance on BOO SCARES! for the most part this is effective teen-friendly scare-fare. Final Rating – 7 / 10. 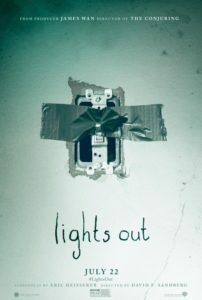 A little ‘light’ (tee-hee) for a horror film, but decent enough.